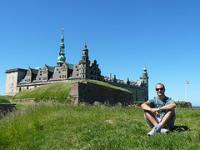 Kronborg Castle is a Renaissance castle, built in 1574-1585 by Danish King Frederik II. It has played a significant role in the history of this part of northern Europe, because of its strategic position between the North Sea and the Baltic. 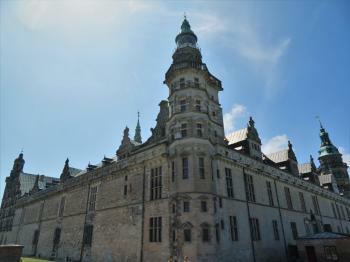 Another claim to fame is that Kronborg ('Elsinore') was the setting for Shakespeare's play Hamlet. There are still signs of the former shipyard that is mentioned in the ICOMOS report. Although Kronborg can be seen from the train station of Helsingor, you have to cross some industrial heritage to reached its main gate. The castle has been strongly fortified, with walls, bridges and canals that could withstand attackers. Inside, you can visit the Maritime Museum and the Apartments. The spacious Apartments are decorated with Dutch paintings and tapestries depicting hunting scenes. The major drawcard here is the banquet hall, where a good party could be held. I tried my best to really enjoy this castle, I achieved middling success. After already visiting Frederiksborg and Rosenborg, my efforts to visit even more castles were not filled with much excitement. Nevertheless, I started the day walking to Copenhagen Central station and getting on the train to Hillerød. After the exquisite Fredericksborg, we took the train to Helsingør. We spent about 2.5 hours at Kronborg. The views from the tower were stunning and one of the prime locations to understand OUV as the layout and elaborate fortifications were all on display. The next primary site of interest for me was the sub levels of the castle, in which food/drink was stored, protection during a siege, and some of the oldest components of the castle. You can enrich your visit to this portion of the castle by waiting for the guided tour. Lastly, I should mention the Hamlet connection. Actors are usually on-site. There are scenes that are (somewhat) spontaneously orchestrated throughout the castle interior and exterior at different times. We viewed one scene by the fountain, and I would say it was enjoyable enough and added a bit of fun to the visit. 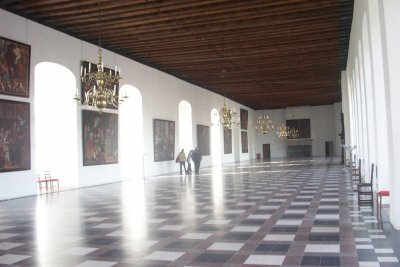 Most of the interior of the castle is not particularly interesting, and little is on display. Once again, the castle is covered with the Copenhagen Card, which is convenient. Kronborg is very much worth visiting, but it suffers in comparison with other Danish castles both in North Zealand and Copenhagen. We came to Kronborg in January 2016 by train from Copenhagen and spent a night in this small, quiet city. The castle being the supposed setting of Hamlet, the gift shop sells novelty Yorick skulls. It was cold enough that seawater had frozen to the rocks, making for a picturesque view (and to answer Ian Cade's musing, you can indeed see Sweden). Inside the castle it was fairly typical of European palaces, though not as impressive as sites such as Brühl, Würzburg or Blenheim. There were plenty of local paintings on the walls and some mocked-up royal bedchambers, but overall it was quite bare, with no ‘knockout’ ceiling frescoes or the like. The chapel was nice, but difficult to photograph internally. 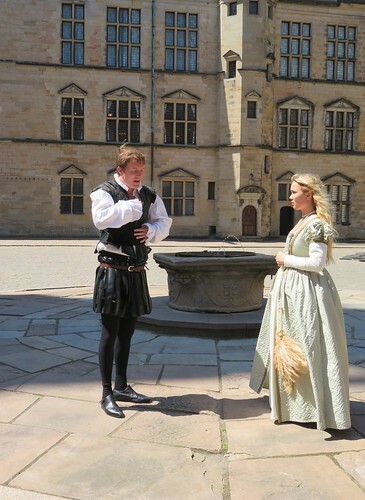 A good idea of somebody’s was to put photographs of the famous actors who have played Hamlet at Kronborg in what has become a well-established annual tradition. I visited this WHS in June 2011. 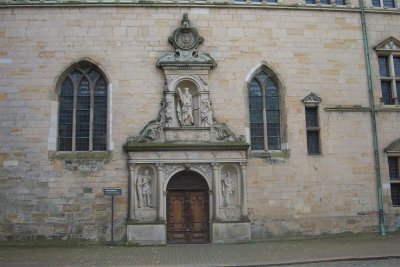 This castle is believed to be the Elsinore Castle, the setting of Shakespeare's Hamlet. Opposite the series of cannons, there is an unobstructed view of Sweden's Helsingborg. Kronborg Castle is one of the national symbols of Denmark and probably the most famous castle in Northern Europe. It stands guard over the Öresund and was notorious for the Sound Tolls it collected from all ships entering the Baltic Sea. Today it is a major tourist attraction and an easy train ride away from Copenhagen. Combined with a ferry ride over to Sweden and a visit to Malmö (followed by a train ride over the Öresund Bridge), it makes a great day trip. 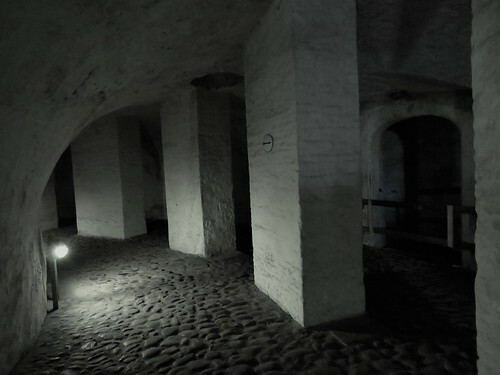 The castle has many historic features, including a chapel and very dark underground corridors with a statue of Holger Danske, and there is an interesting maritime museum, for which a new building is due to open in 2013 outside the castle. I found Kronborg very interesting, but somehow I suspect that it would not have made the WH list without its association to Shakespeare and Hamlet. New Year’s eve and New Year’s day are always awkward times to visit world heritage sites, and for the third year in a row I found myself locked out of a chilly northern European WHS. I know that it will be like this, and I have actually started to enjoy these half visits. 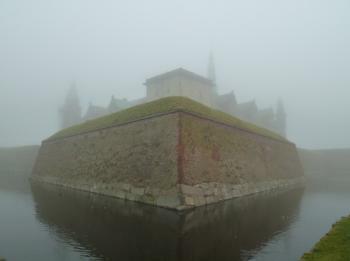 2011/12 led me to Kronborg castle, walking over its ramparts and spying its impressive interior across its moats and through a rather romantic blanket of fog. Obviously I can’t claim to have seen the best of the site, or offer a full review, but it was actually very enjoyable to be locked out of this impressive fortress, and certainly feel I can count it as a visit, having done a lap and ducked into any open facility in order to warm up. The castle is located at the tip of the little town of Helsingør. I would assume on days with better viability you could see Sweden, just across the narrow stretch of water. This slender channel was the reason for the castle’s creation, as it was essentially a very early and fearsome toll both, collecting taxes on good shipped to and from the Baltic. It is good to see the role of taxes and duties still plays a strong role in the economic life of the city, as the centre is full of shops selling alcohol to Swedes who made the short hop on the ferry. It does make you think though about cost of living if you have to go to Denmark! for cheaper booze. 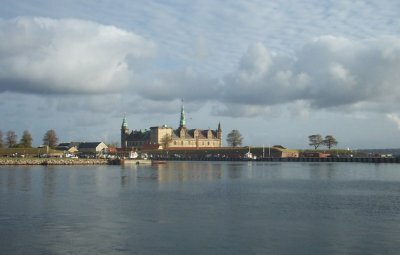 Helsingør is easy to reach from Copenhagen by regular trains that take about an hour. It was a rewarding place to visit, even if I did miss out on seeing the inside of it. I agree that it is location that makes this castle special, although far from unique. There are more spectacular castles around the coast of Scotland (non-WHS). But the view from the Helsingborg ferry is outstanding. And I did the tour of the battlements, the dungeons and the Royal Chapel too. After reading few of the reviews i was not expecting anything special on this site, but the castle is very nice. The location is strategically very good. The most special for me was the Maritime museum, with a lot of models of ships. Castle Fredriksborg near is nice too (but for me a bit overdecorated) and you can see both of them if you are doing a trip from Copenhagen by train. Be sure you buy the "right" train ticket, it is always worth to buy the 10klip ticket as it is cheaper and you can combine 4*2 klips as one 8klip ticket. Ask the ladies in the counter on railstation. 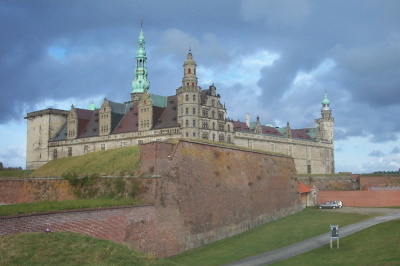 Perhaps the fact that Kronborg Castle has not yet been reviewed on this site tells one something – that its Shakespearean fame as the site of Elsinore, the “Home of Hamlet” somewhat exceeds the reality of this mainly 17th century structure. Shakespeare wrote the play around 1600 but Hamlet was a legendary figure whose “exploits” had been recorded as early as 1200CE and which probably go back to the sagas. His “connection” with Elsinore appears to have been solely in Shakespeare’s imagination. The existence of a castle at this spot goes back to at least the 12th century and a significant fortress was built around 1420 to support the levying of tolls on shipping passing through the straight. The castle however reached its greatest magnificence in 1585 (which perhaps explains Shakespeare’s use of it as a location 15 years later). The structure we see however dates from rebuilding following a fire and strengthening from 1620 to 1685. Its position (photo) is attractive enough but all I really remember of its interior was its rather large banqueting hall (Els’s review struck a chord there!). That is not to say that, as castles go, it is not worth seeing, but “of universal value”? Whatever that phrase really means, this must be pretty marginal! Even the ICOMOS review seems somewhat concerned about building up the case for accepting the nomination and, to misquote Shakespeare’s Hamlet (III, ii, 239) itself:- “The reviewer doth protest too much methinks”! Hmmm? Unless you are a great castle enthusiast or you will only “count” a visit if you go inside the building it is probably enough to see it en passant during the ferry ride – the view from the sea in my view best captures what the site is about anyway! 3.0: Walter Alexander Barabanov Klaus Freisinger Svein Heltberg Wojciech Fedoruk Juha Sjoeblom Kyle Magnuson Ralf Regele Anna Olshäll Xiao Zehuan Peter A. Prison: From 1739 until the 1900's, Kronborg was used as a prison for slaves.